It's powered by a Euro 4 compliant liquid cooled 249cc single cylinder engine, producing 24.4bhp at 8,500rpm and maximum torque at 6,750rpm. 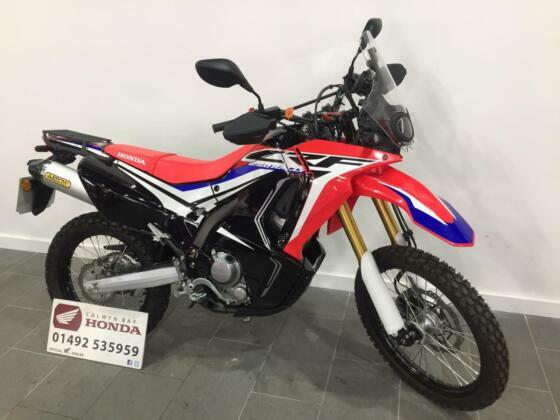 The Rally is based on the £750 cheaper 2017 update of the CRF250L but with a longer travel rear shock, longer front fork (same travel), larger front disc, a screen, larger tank, hand guards, more protective bodywork and funky looking LED headlight cluster. The seat is 20mm higher and it weighs 13kg more. Unusually the radiator is on the left of the bike and the brake discs are designed to be self cleaning for muddy off-road work. There's also a little lockable storage compartment under the seat, accessible from the left of the bike - check the pics above. The indicators also double as daytime running lights like the Africa Twin. The wire spoked 21" front wheel takes a 3.00 tyre and the rear 18" a 120/80.